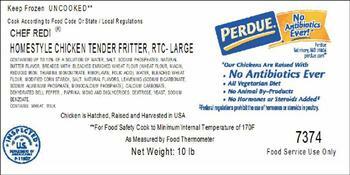 Perdue Foods of Monterey, Tenn., is recalling approximately 530 pounds of chicken fritters. The product contains eggs, an allergen not declared on the label. The ready-to-cook chicken breast tenderloin fritters were inadvertently labeled with the Homestyle Chicken Tender Fritter label. The fritters contain egg whites and the Homestyle Chicken Tender Fritters do not. 10-lb. boxes containing two 5 lb. plastic bags with the box labeled “CHEF REDI HOMESTYLE CHICKEN TENDER FRITTER, RTC – LARGE” with the case code of 7374. The recalled product, bearing establishment number “P-11507” inside the USDA mark of inspection, was shipped to food service locations in Florida, Maryland and Washington, D.C.
Consumers with questions may contact Perdue consumer relations, at 1-877-727-3447.